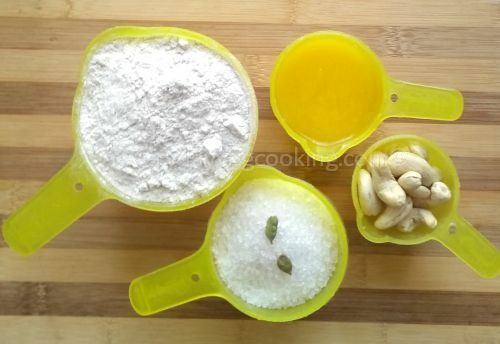 Atte ka halwa is a traditional North Indian dessert which is one of the easiest and quick recipes. Atte ka halwa is made with a very few ingredients which are easily available on every kitchen shelf. In North Indian families, atte ka halwa is prepared on festivals and other special celebrations such as birthdays, family get-togethers, etc. This sweet delicacy is everyone’s favourite in our family. We really don’t need a reason to make this delicious atte ka halwa. I often make atte ka halwa for breakfast or for our Sunday brunch. Dry roasted moong dal ka papad. Puri and aloo ki sabzi. Heat desi ghee in a heavy bottom kadhai (wok). Fry cashew nuts until golden. And then take them out. In the remaining ghee, add atta, mix well and roast on low flame. Slowly, the mixture will start turning golden and a very nice aroma will be obtained. Roast the atta until it turns dark golden and the ghee separates. Boil three cups of water in a saucepan. Slowly pour hot water over roasted atta, keep stirring continuously (this will prevent the forming of lumps) till atta absorbs all the water. Now add sugar and cardamom powder and cook for 4 to 5 minutes on a low flame, keep stirring continuously. 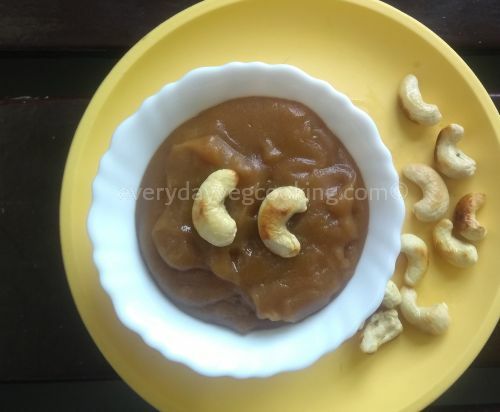 Transfer steaming hot halwa in individual bowls and garnish with roasted cashew nuts. Relish halwa with your favourite accompaniment. 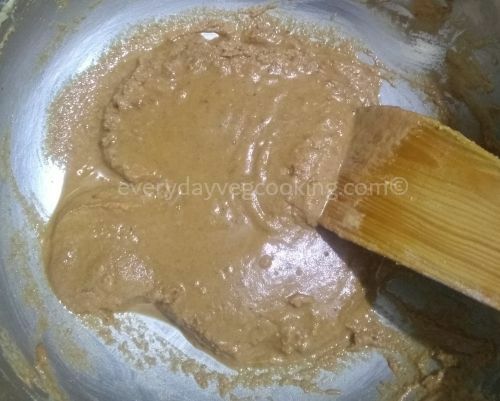 Roast atta (wheat flour) on low heat otherwise raw smell and raw taste of atta will spoil the taste of the halwa. This is my second best favourite hallway after moong dal hallway! Our neighbour aunty in Nagpur, who was from UP used to make this delicious halwa when I was young. She would serve it with a lovely sweet tea flavoured with ginger during cold winter days! I have not been able to get the same taste as hers in all these years. Maybe your recipe will recreate the taste and flavour. Will try this recipe. Try this recipe and let me know the results, hope you get UP wali auntie Wala taste.